Check out a species on Systema dipterorum. If you had checked these you would have seen both are restricted to the west coast. Actually quite fond of SD, though thanks for the thought. I ruled out C. nigriventris based on Curran's key ("Thorax wholly yellow pilose, or with a narrow, incomplete black pilose band between the roots of the wings") - this fly certainly doesn't fit that description. Unfortunately I can't get the original species description by Walton. Do you have specimens of nigriventris that have such a broad band? Yes. Try Criorhina intermedia which is a synonym of C. nigriventris. 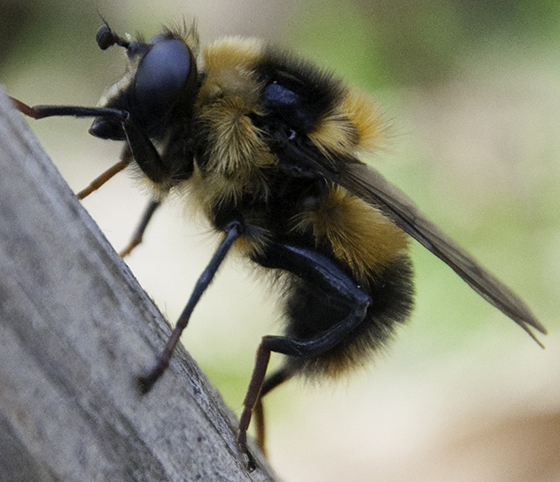 Bumble bee mimetic flies are horrendously variable in setal coloration. It is possible that several described species are actually just color morphs of one species. I know three extreme cases off the top of my head. C. aurea has a mostly black morph (Which you can see on bugguide) and a mostly yellow morph on which the species was described . C. coquilletti was described from a black morph but it also has a yellow morph. (You can see both on bugguide) One of the undescribed neotropical species has a entirely black morph and a black and yellow morph. Yup, that was my problem too!